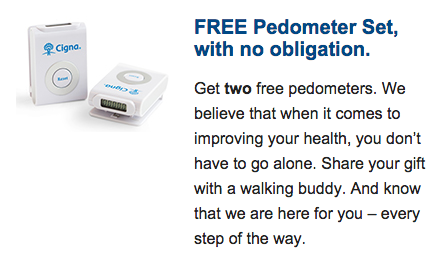 2 FREE Pedometers From CignaHealth! You are here: Home / FREEbies / 2 FREE Pedometers From CignaHealth! If you are in an area that offers CignaHealth Care – Get 2 FREE Pedometers From CignaHealth! Submit the online form to request your 2 FREE Pedometers From CignaHealth! !